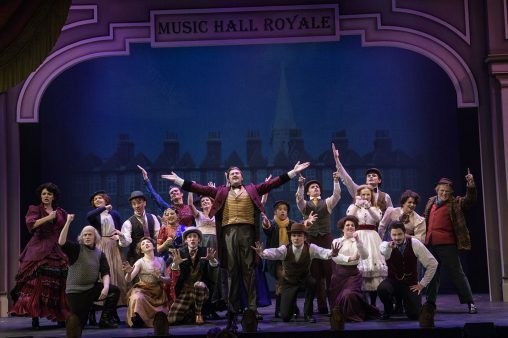 Wright State University Theatre concludes its 43rd season in the Festival Playhouse with the Tony Award-winning musical “The Mystery of Edwin Drood” from March 15 to April 8. Performances are March 15, 28, 29 and April 5 at 7 p.m.; March 16, 17, 30, 31 and April 6 and 7 at 8 p.m.; March 18, 31 and April 1, 7 and 8 at 2 p.m.
Tickets are $22 for adults and $20 students and seniors. For tickets and theatre information call the Box Office at 937-775-2500, or purchase single tickets online. “The Mystery of Edwin Drood” is inspired by the unfinished novel by Charles Dickens. “Drood” became a Broadway hit, winning Tony Awards for Best Musical, Best Book and Best Score, all by Rupert Holmes, in 1986. During the tune-filled musical, the audience determines the ending of the show, guaranteeing a unique performance each night. Dickens died before he was able to finish the novel, so audience members vote on who murdered Edwin Drood. “The Mystery of Edwin Drood” is directed and choreographed by Greg Hellems (“9 to 5”) with musical direction by Scot Woolley (“9 to 5,” “No, No, Nannette”). Sets are designed by Pam Lavarnway (“The Grapes of Wrath,” “No, No, Nanette”), lighting by Matthew P. Benjamin (“Restoration!”), costumes by Elizabeth Bourgeois (“The Grapes of Wrath,” “9 to 5”), properties by John Lavarnway (“The Grapes of Wrath,” “Fiddler on the Roof”), sound by Ryan Burgdorf (“Restoration!”) and stage management by Makayla Michael (“Macbeth”). Featured onstage are Kenneth Erard (Chairman, Mayor Sapsea), Rachel Woeste (Mr. James Throttle, Stage Manager), Kyle Miller (John Jasper), Megan Valle (Edwin Drood, Shade of Drood), Emma Buchanan (Rosa Bud, Shade of Rosa ), Michaella Waickman (Wendy, Maid), Rachel Mary Green (Beatrice, Flo, Maid), Alejandria Solis (Helena Landless), Nick Wasserbauer (Neville Landless), Sam Maxwell (The Reverend Mr. Crisparkle), Casey Borghesi (Princess Puffer), Kyle Sell (Durdles), Cody Westbrook (Deputy), Joey Kennedy (Bazzard, Waiter), Will Graber (Horace, Shade of Jasper), Megan Arsenseau (Succubae), Taylor Patrick (Succubae) and Mackenzie Kasbaum (Succubae). The ensemble includes Megan Arseneau, Taylor Patrick, Christopher Wells, David Emery, Zach Fretag, and Mackenzie Kasbaum.